انتخاب روغن مناسب یکی از مهم‌ترین عواملی است که بر کیفیت محصولات سرخ‌شده تأثیر می‌گذارد. هدف از این تحقیق کاهش میزان آکریل‌آمید و جذب روغن برش‌های سیب‌زمینی سرخ‌شده با استفاده از اثر آنتی‌اکسیدانی روغن‌کنجد (غلظت‌های 1 و 2 درصد، وزنی/وزنی) و مواد صابونی‌ناشوندۀ آن (غلظت‌های 0/02 و 0/04 درصد، وزنی/وزنی) در دمای 180 درجۀ سانتی‌گراد بود. داده‌ها در قالب طرح کاملاً تصادفی و براساس آزمون توکی تجزیه‌وتحلیل شدند. نتایج حاکی از کاهش معنی‌دار جذب روغن و مقدار آکریل‌آمید همگام با افزایش درصد اختلاط روغن‌کنجد و مواد صابونی‌ناشوندۀ آن بود (P<0/05) به‌طوری‌که کمترین میزان آکریل‌آمید مربوط به برش‌های سرخ‌شده در روغن سرخ‌کردنی حاوی مواد صابونی‌ناشوندۀ 0/04 درصد بود که میزان آکریل‌آمید را در حدود 61 درصد نسبت به نمونۀ شاهد کاهش داد (P<0/05). همچنین بیشترین میزان رطوبت و کمترین میزان جذب روغن مربوط به برش‌های سرخ‌شده در روغن سرخ‌کردنی حاوی 0/04 درصد مواد صابونی‌ناشونده بود که 30/8 درصد میزان رطوبت را نسبت به نمونۀ شاهد افزایش و 45/9 درصد میزان جذب روغن را نسبت به نمونۀ شاهد کاهش داد (P<0/05). زمانی قلعه شاهی، ع.، فرهوش، ر. و رضوی، م.ع. 1391. ارزیابی اثر صمغ‌های دانۀ ریحان، متیل‌سلولز و گزانتان بر میزان جذب روغن در خلال‌های سیب‌زمینی طی سرخ‌کردن عمیق. پایان‌نامه کارشناسی ارشد دانشگاه فردوسی مشهد. شرایعی، پ. 1389 .اثر روغن مغز پستۀ وحشی و مواد صابونی‌ناشوندۀ آن بر پایداری روغن‌های کانولا، پالم اولئین، زیتون و اثر نوع روغن و فرایندهای مقدماتی بر میزان جذب روغن سیب‌زمینی طی فرایند سرخ‌کردن عمیق. رساله دکترای دانشگاه فردوسی مشهد. توسلی‌کفرانی، م. و فرهوش، ر. 1389. بررسی خواص آنتی‌اکسیدانی روغن پوست پستۀ وحشی (Pistaciaatlantica subsp. mutica) و مواد صابونی‌ناشوندۀ آن. پایان‌نامه کارشناسی ارشد صنایع غذایی دانشگاه فردوسی مشهد. متقی، م.، اردبیلی، م.، هنرور، م.، مهربانی، م. و باقی‌زاده، ا. 1391. تعیین آکریل‌آمید در نان‌های مسطح سنتی شهرستان کرمان به روش LC/DAD و مطالعۀ تأثیر عصارۀ رزماری بر تشکیل آن. 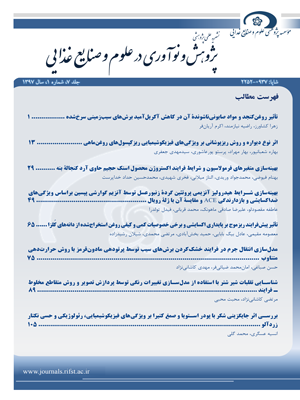 مجلۀ نوآوری در علوم و فنّاوری غذایی، 4(4): 16-7. محمدی، ت.، حاتمی، م.، میرزائی سیس‌آبادی، ی.، هوشیاری، ع. و نجاتیان، م. 1393. فرمولاسیون روغن‌مایع مخلوط حاوی روغن‌های کانولا و کنجد بدون‌ آنتی‌اکسیدان سنتزی. مجله علوم تغذیه و صنایع غذایی ایران، 9(3): 92-83. مرزبانی، م. و صادقی، ر. ۱۳۸۹، مروری بر تشکیل آکریل‌آمید در مواد غذایی حرارت‌دیده و اثرات مخرب آن بر سلامت انسان. همایش منطقه‌ای یافته‌های نوین شیمی و مهندسی شیمی، 9-7 آبان ماه، کرمانشاه. موسویان، د.، نیازمند، ر. و شرایعی، پ. 1391. بررسی تأثیر فرایندهای مقدماتی روغن مغز بنه و مواد صابونی‌ناشوندۀ آن بر میزان آکریل‌آمید سیب‌زمینی طی فرایند سرخ‌کردن عمیق. پایان‌نامه کارشناسی ارشد صنایع غذایی، دانشگاه آزاد اسلامی- واحد دامغان. Abdulkarim, S.M., Myat, M.W., & Ghazali, H.M. 2010. Sensory and Physicochemical qualities of palm olein and sesame seed oil blends during frying of banana chips. Journal of Agricultural Science, 2(4):18-29. Amrein, T.M., Schönbächler, B., Rohner. F., Lukac, H., Schneider, H., Keiser A., Escher, F., & Amado, R. 2004. Potential for acrylamide formation in potatoes: data from the 2003 harvest. European Food Research and Technology, 219(6):572-578. Amrein, T.M., Bachmann, S., Noti, A., Biedermann, M., Barbosa, M.F., Biedermann-Brem S., Grob, K.,Keiser, A., Realini, P.,Escher, F.,& Amado, R. 2003. Potential of acrylamide formation, sugars, and free asparagine in potatoes: a comparison of cultivars and farming systems. Journal of Agricultural and Food Chemistry, 51(18):5556-5560. Barrera-Arellano, D., Ruiz-Mendez, V., Velasco, J., Marquez-Ruiz, G., & Dobarganes, C. 1999. Loss of tocopherols and formation of degradation compounds in triacylglycerol model systems heated at high temperature. Journal of the Science of Food and Agriculture, 79(13):1923-1928. Budowski, P., & Markely, K.S. 1951. The chemical and physiological properties of sesame oil. Chemical. Reviews, 48(2): 125-151. Capuano, E., Olivero, T., Acar, O.C., Gokmen, V., & Fogliano, V. 2010. Lipid oxidation promotes acrylamide formation in fat- rich model systems. Food Research International, 43(4):1021-1026. Delgado-Andrade, C., Seiquer, I., & Navarro, P. 2004. Bioavailability of iron from a heat treated glucose-lysine model food system: Assays in rats and in Caco-2 cells. Journal of the Science of Food and Agriculture, 84:1507-1513. Dobarganes, C., Márquez-Ruiz, G., & Velasco, G. 2000. Interactions between fat and food during deep-frying. European Journal of Lipid Science and Technology, 102(8-9):521-528. Farhoosh, R., EsmaeilzadehKenari, R., & Poorazrang, H. 2009. Frying Stability of Canola Oil Blended with Palm Olein, Olive, and Corn Oils. Journal of the American Oil Chemists’ Society. 86(1):71-76. Fukuda, Y., Nagata, M., Osawa, T., & Namiki, M. 1986. Contribution of lignin analogues to antioxidative activity of refined unroasted sesame seed oil. Journal of American Oil Chemist’ Society, 63:1027-1031. Gunstone F.D. 2002. Vegetable Oil in Food Technology. P. 337. CRC Press, Boca Raton, USA. Hedegaard, R.V., Granby, k., Frandsen, H., Thygesen, J., & Skibsted, L.H. 2008. Acrylamide in bread. EVect of prooxidants and antioxidants. European Food Research and Technology, 227:519-525. Hwang, L.S. 2005. Sesame Oil. Baileys industrial oil and fat product. Taipei, Taiwan, University. Innawong, B., Mallikrjunan, P., & Marcy, J.E. 2004. The determination of frying oil quality using a chemosensory system. LWT-Food Science and Technology, 37(1):35-41. Kamal-Eldin, A., Appelqvist, L.A., & Pettersson, D. 1995. Sesamin (acompound from sesame oil) increases tocopherol levels in rats fed ad libitum. Lipids, 30(6):499-505. Keramat, J., LeBail, A., Prost, C., & Jafari, M. 2011. Acrylamide in Baking Products: A Review Article. Food and Bioprocess Technology, 4(4):530-543. Kochhar, S.P. 2000. Stabilisation of frying oils with natural antioxidative components. European Journal of Lipid Science and Technology, 102(8‐9):552-559. Lea, C.H., & Ward, R.J. 1959. Relative antioxidant activities of the seven tocopherols. Journal of The Science of Food and Agriculture, 10:537-548. Lehotay, J., & Mastovska, K. 2006. Rapid sample preparation method for LC-MS/MS or GC-MS analysis of acrylamide in various food matrices. Journal of Agricultural and Food Chemistry, 54(19):7001-7008. Lozano, Y.F., Dhuique Mayer, C., & Gaydou, E.M. 1993. Unsaponifiable matter, total sterol and tocofherolcantents of avocado oil varieties. Journal of the American Oil Chemists, 70(6):561-565. Namiki, M. 1995. The chemistry and physiological functions of sesame. Food reviews international. 11(2):281-329. Orthoefer, F.T., Gurkin, S., & Liu, K. 1996. Dynamics of frying. In: Deep Frying: Chemistry, Nutrition, and Practical Applications. Perkins E.G., and Erickson, M.D. AOCS Press, Champaign Illinois, USA. Oua, S., Shia, J., Huanga, C., Zhanga, G., Tenga, J., Jianga, Y., & Yanga, B. 2010. Effect of antioxidants on elimination and formation of acrylamide in model reaction systems. Journal of Hazardous Materials, 182(1):863-868. Quasem, J.M., Ayman Suliman Mazahreh, A.S., Khaled Abu-Alruz, K., Afaneh, I.A., Al-Muhtaseb, A.H., & Magee, T.R.A. 2009. Effect of methyl cellulose coating and pre-treatment on oil uptake, moisture retention and physical properties of deep-fat fried starchy dough system.American Journal of Agricultural and Biological Sciences, 4(2):156-166. Shahidi, F. 2005. Bailey’s Industrial Oil and Fat Products. (6th edn), John Wiley & Sons, Inc, simultaneously in Canada. Stadler, R.H., Blank, I., Varga, N., Robert, F., Hau, J., Guy, P.A., Robert, A-C., & Riediker, S. 2002. Food chemistry: Acrylamide from Maillard reaction products .Nature, 419:449-450. Tareke, E., Rydberg, P., Karlsson, P., Eriksson, S., & Tornqvist, M. 2002. Analysis of acrylamide, a carcinogen formed in heated foodstuffs. Journal of Agricultural and Food Chemistry, 50(17):4998-5006. Troncoso, E., & Pedreschi, F. 2009. Modeling water loss and oil uptake during vacuum frying of pre-treated potato slices. LWT- Food Science and Technology, 42(6):1164-1173. Tyagi, V.K., & Vasishtha. A.K. 1996. Changes in the characteristics and composition of oils during deep-fat frying. Journal of the American Oil Chemists- Society, 73(4):499-506. Zeng, X., Cheng, K., Yegang, D., Ricky, K., Clive, L., Ivan, K.C., Feng, C., & Mingfu, W. 2010. Activities of hydrocolloids as inhibitors of acrylamide formation in model systems and fried potato strips. Food Chemistry, 121(2):424-428. Zhang,Y.U., & Zhang, Y.I. 2008. Effect of natural antioxidants on kinetic behavior of acrylamide formation and elimination in low-moisture asparagine–glucose model system. Journal of Food Engineering, 85(1):105-115.